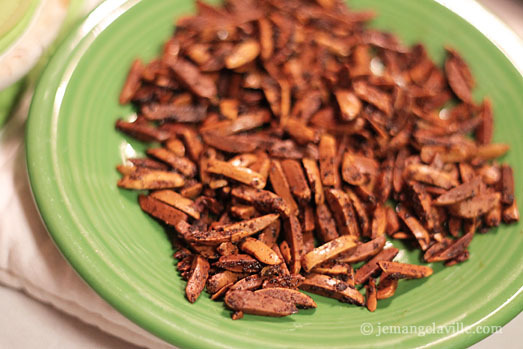 « December is Pear Month: Caramelized Fennel with Pear, Almonds and Parmesan plus a Giveaway! After a super filling meal of turkey, stuffing, roasted vegetables and pumpkin pie it always seems like a sensible idea to eat some fish, right? Especially when you think back on all the cheese, crackers and wine that was part of the holiday (week) too. Or maybe it’s just me? Or maybe it’s just that when you spend Thanksgiving in Fargo, North Dakota you need a lot of snacks to keep warm? 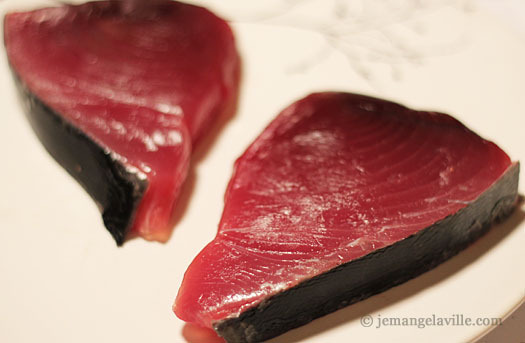 It doesn’t matter which really, because this tuna is awesome! A crusted, flavorful piece of fish with a spicy, minty sauce. 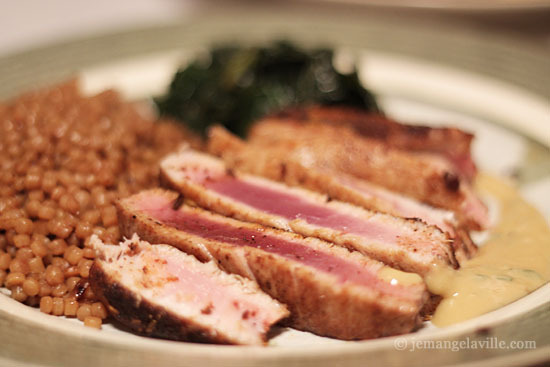 And while I normally prefer my seared tuna with an Asian twist, this (Latin-Mediterranean-Middle Eastern-fusion type) spice blend makes a wonderful compliment to the richness of the tuna. With some whole wheat pearl couscous and kale chips on the side you’ve got a delicious meal that isn’t going to make you want to take a nap afterwards (unless you’re already very tired, I guess). Like all of the recent fish dishes I’ve been posting about lately, the tuna came from Flying Fish Company on Hawthorne. The original recipe used four different types of chili powder but I just used what I had — a basic chili powder (Spice Islands brand). 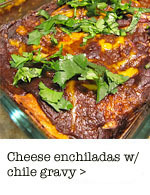 If you’ve got ancho, pasilla and chile de arbol feel free to use them all, otherwise just a blend will do. 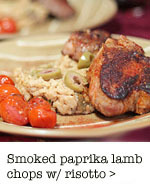 Recipe adapted from Bobby Flay; serves 2. Combine all of the spices in a bowl. 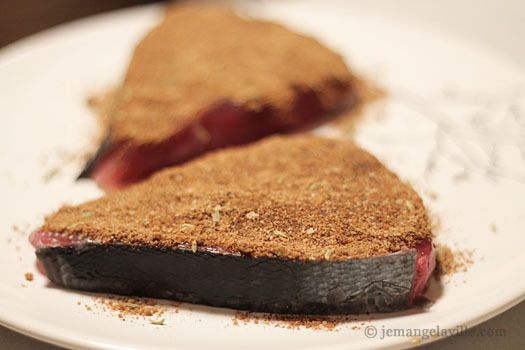 Rub one side of each tuna steak with some of the rub to cover. Heat oil in a large pan over high heat. 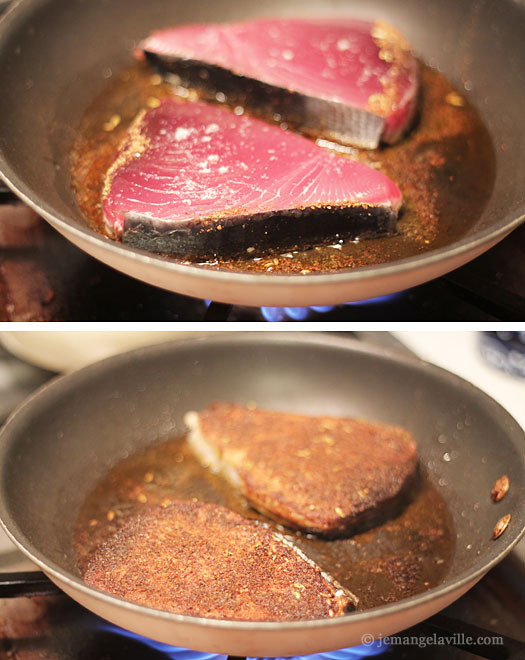 Place the tuna in the pan, rub-side down, and cook until golden brown and the spices have formed a crust, about 2 minutes. Turn over and continue cooking for 1 to 2 minutes for rare doneness. 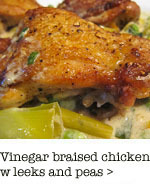 Set aside on a plate, tented loosely with foils while you make the sauce. 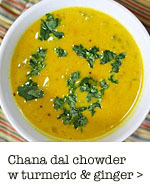 For Mustard Mint Sauce: Whisk together all ingredients in a small bowl and season with salt and pepper, to taste. 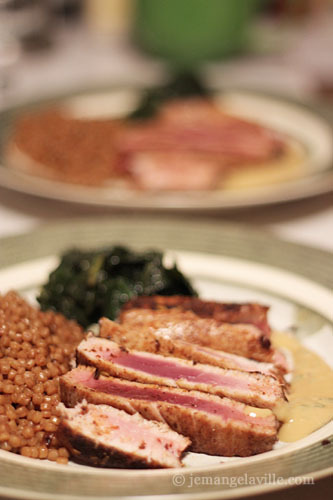 To serve, slice the seared tuna and fan out an equal number of pieces among two plates. Spoon some of the sauce to each side of the tuna slices. 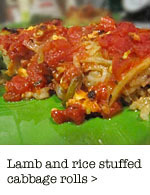 Bonus: The spice mix will make more than you need for this recipe. But, that’s okay because it’s also great for making spiced nuts. I’ve been taking about a teaspoon of the spice mix and combining it with a little olive oil to make a paste and then tossing in a 1/2 cup or so of slivered almonds. Bake at 350 degrees F for about 10 minutes. The spiced nuts are great for just eating as is or on top of a huge kale salad.